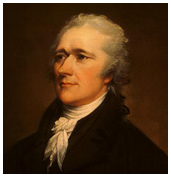 Alexander Hamilton is considered by most historians to be a Founding Father of the United States of America. He was the country's first Secretary of the Treasury, and can still be seen as the face on the nation’s ten dollar bill. He was considered to be a political philosopher and was a coauthor of the Federalist Papers along with James Madison, and John Jay. During the Revolutionary War, Hamilton first served with the New York militia and later become an aide to General George Washington. He fought at Yorktown leading several battalions in battle. After the war, he practiced law and founded the Bank of New York. He also served in the state legislature in New York. When Washington became the first President of the United States, Hamilton went to work for him as the Secretary of the Treasury. Hamilton was well known for his belief in a strong central government, much like the British had. Hamilton represented one of the two factions in the early years of the new nation. Opposed to him were the Thomas Jefferson and James Madison. This latter coalition opposed Hamilton's policy of trade and close relations with Britain, as well as his ideas of a strong central government. Jefferson's coalition became known as the Democratic-Republicans and a rivalry between top party member Aaron Burr developed. The election of 1800 became a competition between the top two party leaders as the Federalist's ideas had lost much of their appeal to the new Americans. Burr lost to Jefferson and became vice-president. Hamilton created the New York Post shortly after this and developed an intense feud with Aaron Burr. This eventually led to a famous duel which ended with Hamilton being shot. The day after the duel he died from his gunshot wounds. Hamilton's ideas concerning the importance of a strong central government were never lost. During the Revolutionary war it was the decentralized nature of the effort to fight the British that was the beginning of his frustration. After the war he urged the new constitution to be ratified and was the only one from New York to sign the document at the convention. The other two members of the New York delegation had already resigned. He did not like the constitution as it appeared in its final draft, but did see it as better than the Articles of Confederation. The Articles were the previous document that organized the 13 colonies during the Revolutionary War. After signing the constitution, he worked hard to get the state of New York to ratify it. Working with Madison and Jay, he took it upon himself to write the Federalist Papers, which was in essence a defense of the new constitution of the United States. New York ratified the constitution in 1788 and Hamilton was influential in getting all thirteen states to ratify the country's new constitution. Much of the opposition at the time to Hamilton's ideas were due to his support for the British. Many looked upon him with suspicion. But his ideas of a strong central government gained appreciation over time, and many of his ideas concerning the role of the government came to be accepted.